Digital picture frames were one of the hit gifts last Christmas and I’m delighted to say we have 5 to give away to Coolest Gadget readers. We’ve just reviewed the CiBox C107 over on our sister site Coolest Reviews and cool gadget shop Red Save have generously offered to give a CiBox 7 Inch frame to five fortunate CG readers. To be in with a chance of winning, simply leave a comment sharing what you think will be this Christmas’s must have gadget. We’ll close the contest on November 10th and draw the 5 winners from the Random.org proverbial hat. Thanks for reading and good luck. Now what do you think will be the coolest gadget this Christmas? A Roomba model that empties its contents into the trash when needded. Next Christmas: a Roomba that takes out the trash. I think it will be the newest Rock Band game. cell phones- lots of new cell phones, and lower data plans will mean more cell phones sold this year. The Wii of course, just like last year. the must have item, in my opinion. will be the “netbook computer”. The coolest gadget for this xmas will be Rovio the guard robot. No doubt, the iPod iTouch will be the greatest gift to give and get this Christmas. It’s a tough one, but iPods are going to do well, as always, especially the new nano. Also, Apple are pushing the iPod touch through TV Advertising, so that could also be the number one gadget. The price reductions on the xbox 360 will have a great effect… £129 is a bargain price! Does Elmo Live count as a gadget? These will sell out everywhere. Okay, okay, if I can only choose one, it would have to be the Asus EEE Pc – budget laptops will be a massive hit this year, and the small asus range will be a big seller for kids and adults alike. Always beat on Oprah. The Kindle. in games , it’s GOW gun! I say it would be a new HDTV if it’s family…since they are really affordable now and would benifit everyone in the house. Next would be game console, maybe a PS3 which will be able to play Blu-ray on the HDTV.. I think it will be the D-Rex toy dinosaur. Not practical as a gadget ideally should be, but charming. I still think the Wii will be hard to get this Christmas. It’s been two years and you still hardly ever see them. I think it’ll be the new guitar hero game. 1. The new Roombe that can handle carpet AND hardwood floors. 3. For a lot less money, the Leatherman Skeletool. I am hoping for all three…. I agree, the Wii is hard to beat. But digital frames will be the gadget people will buy for 1) people who have everything, or 2) last minute gifts, or 3) people who won’t tell you what they want. oh, and inexpensive GPS units…same arguments as the digital frames. Digital picture frames are fun, but I wonder what we’ll have in 10 years. These things will look so out of place as we see flexible and super thin OLED and other screens coming out… still nice to have. The Iphone 3G is pretty much this year’s gadget, I keep hearing about it and it’s applications. 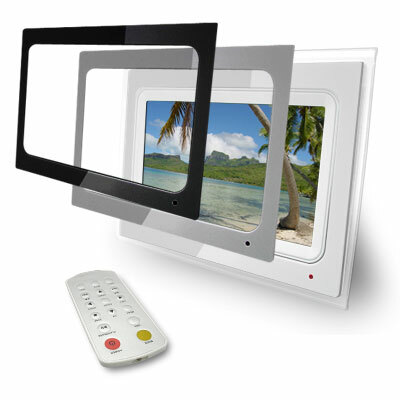 Must have for everyone – Digital Picture frames. This year has seen a massive growth in digital camera sales bringing forward a demand for digital frames of all varieties, from cheap basic low res models up to the bluetooth enabled high res, remote controlled, touch sceen doobelackie’s. Japans Must have will be the new Nintendo DSi. Teenages world over will wish for an iPod Nano 4g if they haven’t already scammed one off their parents. Games wise – yes the Wii-Fit for Nintendo and Little Big Planet for PS3. i think any of the various netbooks will probably be the item this year. Definitely this Xmas gadget will be a USB heating system… All day hot in front of our PC. I think the coolest gadget this Christmas will be a digital picture frame with WiFi, Bluetooth connectivity and one that can play MP3, Video and PowerPoint presentation. If Sony includes these features in its digital picture frames, it should be a hit. A higher memory capacity (8 GB) if in-built could be an excellent feature. Definitely the T-Mobile Iphone copy will be the hottest gadget/gift this Christmas. I think the newest Itouch will be the “it” Christmas present this year. I know it is tops on my wish list! I think it would be the chumby. If you haven’t seen it just search for “Chumby” on this website. I want one! Tv’s, cable/satellite packages, netflix subscriptions, slingbox, etc. 2 months after Christmas is the dtv conversion. I believe the “Kid-Tough Portable DVD Player” is the coolest gadget this Christmas (thinking on my kids!!). Sturdy, simple and great price. the slanket WILL always be the BEST gift!!! I think the coolest gadget this Christmas will be a digital picture frame with WiFi, Bluetooth connectivity and one that can play MP3, Video and PowerPoint presentation. If Sony includes these features in its digital picture frames, it should be a hit. A higher memory capacity (8 GB) if in-built could be an excellent feature. Also add a few other additional features such as FM Radio, Clock/Calendar (perhaps already available) and a killer touchscreen (with zoom function). Could possibly use this as a PC monitor too. Wow! I think Digital Photo Frames will continue to be popular, as will Nintendo Wii’s, they make a great present for the whole family to play! A picture frame that can be linked to a phone so you can recieve photo’s from friends and family instantly. Coolest gadget this year? The picture frame if I win it. Coolest Xmas Gadget? An inflatable Santa USB fan LED torch memory stick keyboard hoover coffee-warming plasma ball. I think for a lot of people it will be a new HDTV. Digital is in and analog is out. You don’t have much of a choice come February. I think Digital SLRs will take off quite well this christmas – Know 3 people who’ve bought one in the last week (including me!). Mobile phones with maps as standard, and updates. Hello everybody:)I think nice gadget this Christmas will be Nintendo DS.Everybody love games,specialy in winter time,when you spend alot time at home in your soft chair.Is small,handy and very comfortable.I love it! The Wii is a always a hit for the party/family crowd. I think the Kindle will be huge this year. MP3 players of any kind. I’m going to have to go with the iPod touch. It was either that or the iPhone, but my guess is that it will do better than the iphone because I’m finding more and more people griping about the carrier. Thanks everybody for your suggestions. The contest is now officially owner and the winners have been drawn. You can see if you’ve won here.